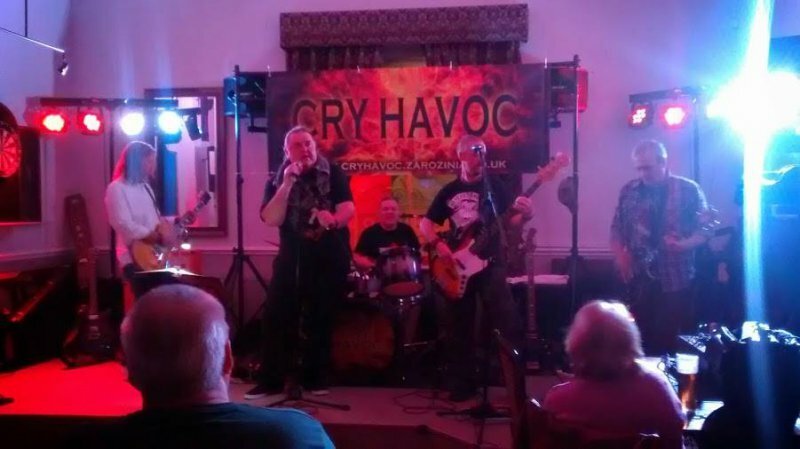 Cry Havoc are a 5 piece rock covers band based in Stockport. We cover bands such as AC/DC, Thin Lizzy, Green Day, Foo Fighters, Black Sabbath, ZZ Top, The Cult, and many more. We cover Stockport, Tameside, Oldham, Manchester and anywhere else that we think we can get too. Please feel free to contact me regarding availability and to discuss fees. "I've seen this lot a few times at the Finger. Great set list! They don't just play the 'rock standards' which is a change from the usual cover bands!!! Always enjoy their gigs." "Saw them last year, they had the place jumping. Great night! " "Great mix of rock covers to suit all tastes. Go see them if you get the chance." "A fantastic band always popular and welcome at the WHITE HOUSE STALYBRIDGE Good night guaranteed "
Have you seen Cry Havoc perform? Has Cry Havoc performed at your venue? Then why not leave them a review?